What is wrong with this image that I captured off the TV? If you just look at it without the audio, probably nothing. I was walking past the TV in the morning where it was screening the news and I started to watch. For a while, I really catch no ball as the newscaster was talking about something totally irrelevant to the image presented before me. I hadn't taken notice of the words at the bottom and at first glance, I thought it was some drug bust but the audio seemed to be talking about a certain trade mark. It took me a while before I realised that the image on the TV has absolutely nothing to do with the news reported at that time. I calculated the area of the screen dedicated to while was being reported i.e. the audio part and it roughly accounted for 20% of the screen while the drug bust image took up 75% (the remaining 5% was the clock reporting the time and the scrolling ticket tape at the bottom). 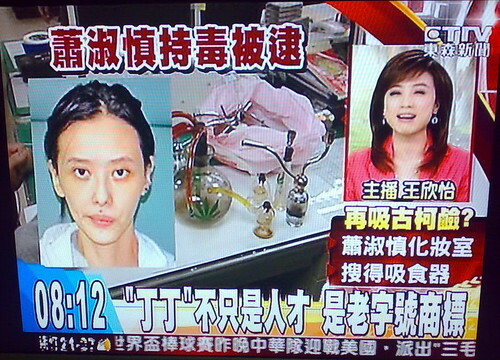 The news station was Ta1wan's ETTV News and my gawd, it was really really bad programming. Whoever responsible ought to be shot! This is absolutely BAD TV!! if there is another thing wrong with it, I would say... INFORMATION OVERLOAD. Little Dowager*: Yes I agree. However, given that we are in the age of the internet, I also have to say that people these days have a much larger propensity to take in more information than the past. Whether the information received are useful or relevant, remains a separate question. cos the person in the drug bust is a celebrity mah. U know how they like to broadcast every teeny weeny bit of news and how they esp. 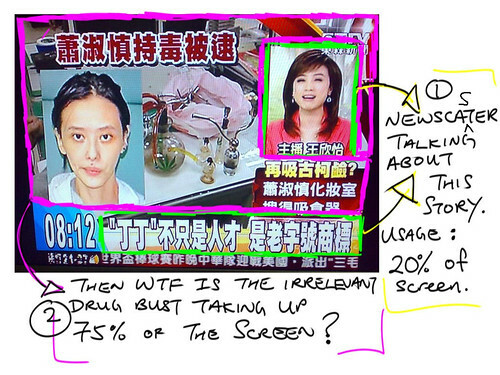 like to broadcast news on celebrities, then u will know why they do this liao. Aloe: I think you missed my point. I don't have a problem with celebrity reportings. My beef is that if you show the celebrity news on the screen (or at the very least majority of the screen), then godammit, report the celebrity news instead of talking about something else that is totally irrelevant i.e. you report what you are showing on screen. Is simple logic soooo difficult for the folks at ETTV?